Is it possible to perform the structural analysis and design of containers with Dlubal Software? With the FEA Software RFEM, it is possible to perform the structural analysis and design of containers (shipping containers, office containers, mobile homes, etc.). 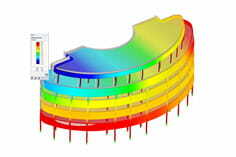 RFEM offers member, surface and solid elements for detailed modeling. All components can be designed in the corresponding add-on modules.